"iTunes doesn't support syncing AVI video to iPhone, but I've been told VLC for iPhone is back onto the App store. Does anyone know how to add AVI file to VLC from my computer so that I can play AVI on iPhone freely without iTunes?" Owners of iPhone 7 or newer understand AVI is totally excluded from iPhone supported video list. Despite iPhone 6S and older models support AVI files, the harsh condition sets barriers to proper AVI playback on iPhone. According to the specs, iPhone accepts AVI video only when it is encoded with Motion JPEG (M JPEG) up to 35 Mbps, 1280 by 720 pixels, 30 frames per second, audio in ulaw, PCM stereo audio. 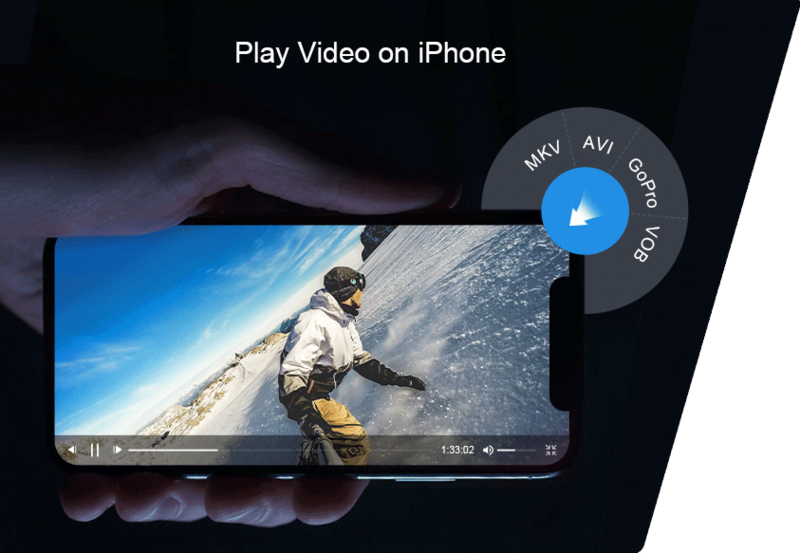 No wonder AVI player apps, especially the famous VLC, have a high profile among iPhone users, particularly when a majority of AVI files nowadays are encoded with DivX or Xvid. Don't jump the gun. Here're 5 reasons why you'd better rely on AVI converter rather than VLC to cope with AVI video playback problem on iPhone. 1. Convert AVI DivX/XviD to MP4 (HEVC/H.264), MOV for iPhone without quality loss. 2. Compress big AVI file to smaller one for more storage on iPhone. 3. Edit, cut, trim, crop, rotate AVI videos and enhance video quality with ease. 4. Batch process AVI and other videos in 4K/HD with full GPU accelerated. iPhone users are quite clear that VLC allows to play AVI on iPhone from your computer. As long as you have downloaded and open VLC for iOS, turn the WiFi Upload on, click on + button after you open AVI file on your Mac or PC, you can add and play .avi video on iPhone without converting. There is no loss of quality. But there are 5 factors you need to be aware of. 1. Wi-Fi is needed. Computer with AVI files and the iPhone need to be on the same Wi-Fi network. 2. AVI video might be bogged down to choppy playback on iPhone due to the unstable Wi-Fi connection. 3. VLC won't play AVI file and results in no audio or picture issue. This is down to the weird codec that VLC won't support. 4. AVI is non-standard to encode aspect ratio information according to Wikipedia. This leads to the failure for players to select the right aspect ratio and results in black bars during the playback on some screens such as iPhone. 5. AVI files, if uncompressed, are large in size as compared to MP4 or other formats. They eat some serious storage space on iPhone. Unless you own a larger capacity iPhone, you'd better re-encode AVI file to MP4, MOV or other more compressed video format for iPhone. Due to the nature of video compression, AVI to iPhone conversion, re-encoding the existing AVI video with another codec iPhone supports, will involve in some loss of quality. This terrifies many users from downloading AVI converter software. But as long as you use a fairly high-quality video transcoder and have a hi-q AVI file, the quality loss won't be noticed with the naked eyes. 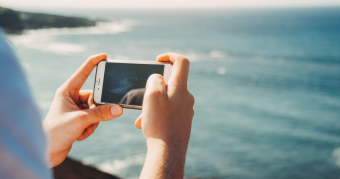 VideoProc, a cover-all iPhone video processing software, is your best bet. 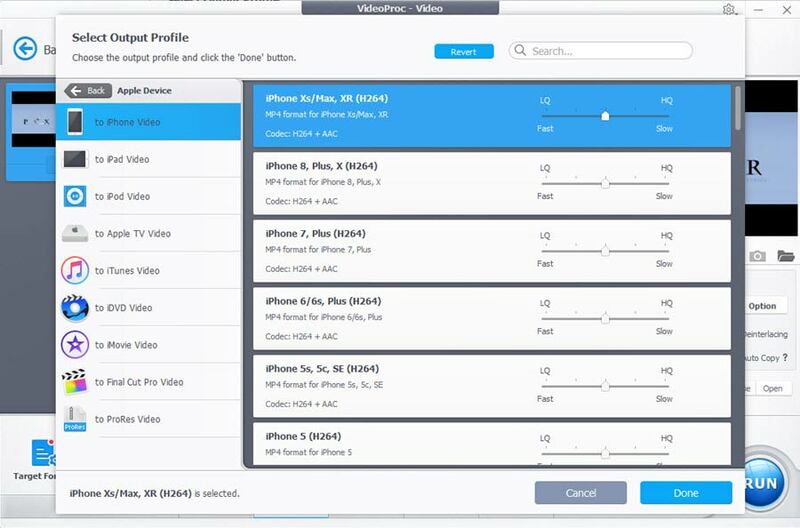 With 370+ audio/video codecs, it enables you to convert AVI DivX/Xvid to MP4 (H.264/HEVC), MOV or other formats your iPhone accept. You will be impressed with its high-quality conversion. Due to the High-Quality Engine and unique Level-3 hardware acceleration powered by Intel QSV/Nvidia/AMD, VideoProc manages to convert any video, even the large-sized 4K video, at high speed, without exerting too much burden on CPU or compromising on video quality. 1. AVI file(s) saved on your computer. Step 1: Load AVI files. Click Video icon to enter video processing window, where you are entitled to press +Video button to load AVI file to be converted. You can import more than one AVI video at a time to batch process video files swiftly. Go to Video at the bottom and Select MP4 H.264 as the output format, which is acceptable by all generations of iPhone. For higher quality and smaller size, you can choose MP4 HEVC as the target format, if you are using iPhone 7 or newer model. Note: If you are unknown of the obscure video settings perfect for the full-screen playback on iPhone, you can even rely on the ready-made profiles for your specific iPhone model. Just click Target Format at the bottom to select output profile > go to Apple Device in Mobile Video Profile category > to iPhone video > choose the iPhone you are working with. Optional: You can click Cut at the video info bar to freely chop off unwanted parts and highlight your AVI video for enjoyment on iPhone. There are still more video editing options at the Toolbox, such as merge, trim, split, rotate, add special effects and more to touch up your AVI file. Click Browse to save the file to the destination folder and press RUN to begin encoding AVI to MP4 or MOV for iPhone. After the conversion, you can use iTunes to sync the converted AVI file to iPhone and enjoy limitless playback on iPhone without worrying about format issue or storage full problem. VLC is a world-famous free video player working with all types of video formats. 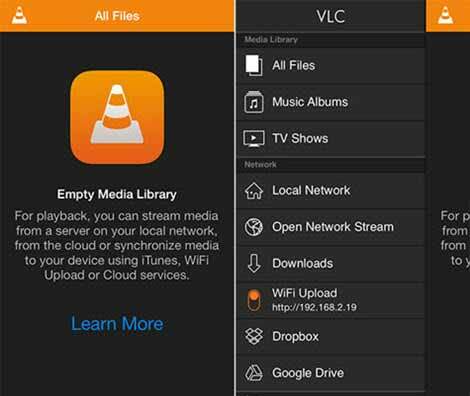 With the VLC for iOS app debuted on App store, users can even enjoy any video files on iPhone iPad with ease. Follow the tutorial below and learn how to play AVI on iPhone directly without any transcoding. Step 1: Go to App store to find and download VLC for iOS on your iPhone. Step 2: Open VLC and enable WiFi Upload, when you will see the toggle switch turns orange. Step 3: Go to your Mac or PC where you have your local AVI file. 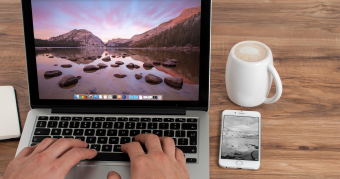 Import the IP address into the address bar. Step 4: Click the + button on the top right corner and open the AVI file to be played. Then the file will be uploaded to iPhone over Wi-Fi. AVI video player for iPhone makes it pretty easy to watch any video files on iPhone, but is functional only when there is Wi-Fi available. If you want to change video format, shrink the file size, edit the video file, adjust the aspect ratio, resolution or other parameters, etc, you can give VideoProc a try. 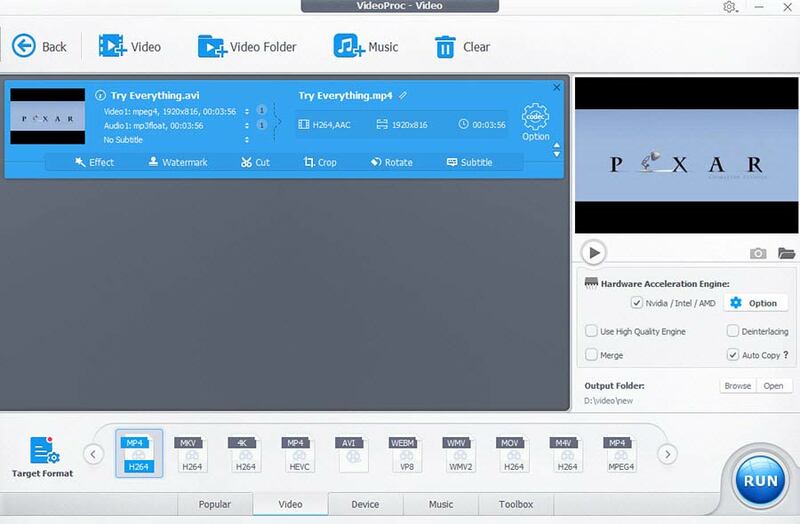 It's a 4-in-1 combo of video converter, editor, downloader and recorder, which is pretty easy to finish all the video tasks. iPhone Won't Play MOV Video? Why and How to Fix it? Follow the post to reduce iPhone video for Instagram with best quality.